Mee Rebus is another favourite of mine while growing up in Singapore. Although not as famous and well known as the Hainanese Chicken Rice, it is still a popular dish in both Singapore and Malaysia. It is also a typical Nonya dish as it combined both malay and chinese ingredient to form a truly unique taste. 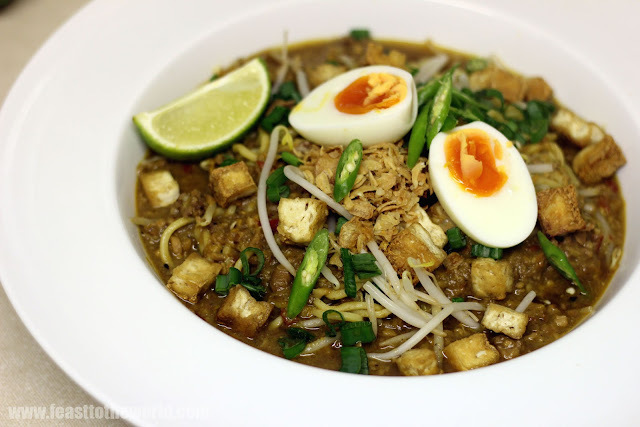 The yellow egg noodles are served in a sweet spicy sauce that is made out of curry paste/rempah, potatoes, dried shrimps, peanut etc and then beautifully garnished with lots of goodies like fried tofu, hard boiled eggs, limes etc. This dish can be found in all Hawker centres (food hall) in Singapore. The recipe I've given here is slightly different to the traditional version as I have added mince beef here, but it does work and produces a far richer sauce. Firtsly, prepare the rempah (This is the corner stone for any Nonya cuisine and is traditionally made in a mortar and pestle). Blitz all the ingredient for the rempah in a food processor into a paste. Next, prepare all the garnishes. Heat the oil in a large pan or a wok over medium-high heat until it starts to smoke, add tofu and fry for about 4-5 minutes, until golden brown. Remove and drain on some kitchen paper. If making your own fried shallots, heat up the oil again and when smoking, add the sliced shallots and fry for 1-2 minutes, until golden brown. Remove and drain on some kitchen paper. To make the broth, heat up some oil in a pan over a medium heat and stir-fry the rempah for 4-5 minutes until fragrant, stirring constantly. Add the curry powder, yellow bean paste and cook for another minute or two before adding in the grated potatoes, peanuts, palm sugar and lastly the beef. Cook for 5 minutes and then add the water and bring to the boil, turn down the heat and simmer for 20-25 minutes until the potatoes has cooked and disintegrated into the broth and thicken it. Season with salt to taste. To serve, blanch the egg noodles in boiling water then drain well. Divide into four equal portions and place in individual serving deep-dishes or bowls. Sprinkle with bean sprouts and pour the gravy over the noodles. 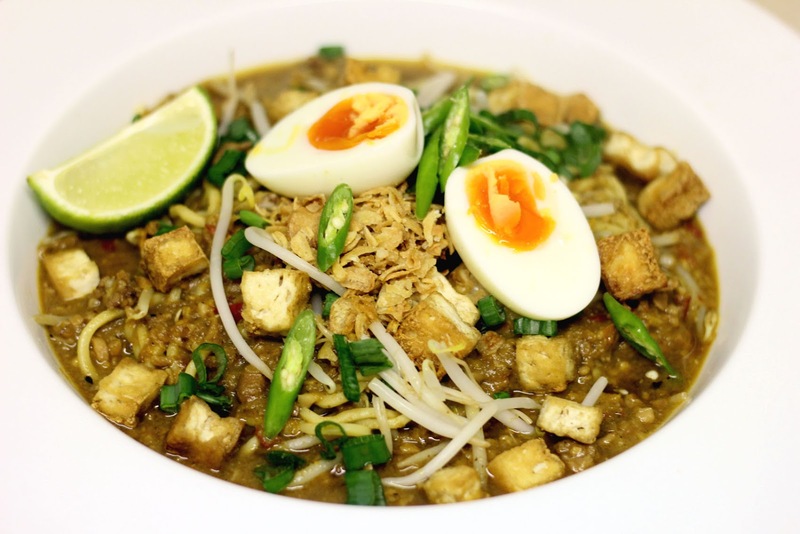 Garnish with eggs, tofu, fried shallots, spring onions, coriander, green chillies and lime.